This is a momentous time for the Korean Peninsula and US-Korean relations. Our speaker, Jin Park will address timely issues including North Korea's denuclearization negotiation and Korea's economic relations with the U.S., China, and Japan. Jin Park who is currently serving as the Chairman of Korean-American Association (KAA) which was created to promote mutual understanding, friendship and cooperation between Korea and the United States. He graduated from the College of law at Seoul National University, Kennedy School of Government at Harvard University (MPA), New York University Law School (LLM) and received a doctorate degree (D. Phil.) in politics from St. Antony’s College, Oxford University. He is a registered member of the New York State Bar Association and a regular member of the Seoul Forum for International Affairs. He has been serving as a Global Fellow since 2014 at the Woodrow Wilson International Center for Scholars in Washington D.C.
Mr. Park leads the Asia Future Institute, an independent policy think-tank designed to conduct research on the U.S.-Asia relationship and promote Korea’s role in the Asia-Pacific region. He served in the 16th, 17th, and 18th sessions of the National Assembly in the central Jongno District in Seoul. While in politics, he served as the Chairman of Foreign Affairs, Trade and National Unification Committee of the National Assembly (2008~ 2010). 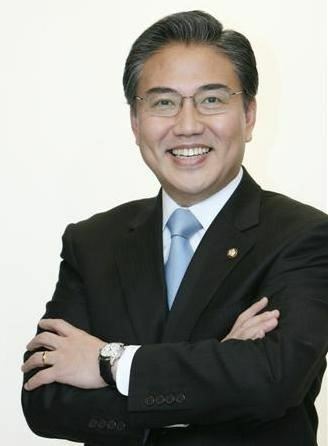 During his distinguished political career, he served as the Presidential Secretary for Press Affairs and later political affairs under the Kim Young-Sam administration between 1993 to 1998 and was elected parliamentary member in August 2002 in Seoul. During his three terms in the national assembly, he served as the member of the science, technology, information and communication committee, a ranking member of the national defense committee, intelligence oversight committee. **Please note that advance registration and pre-payment is required. All attendees will have a $20 charge for the special event meal cost, and registration ends June 11.